Not to be confused with All About Eve. This article is about the film. For the American Dad! episode, see All About Steve (American Dad!). All About Steve is a 2009 American comedy film directed by Phil Traill that stars Sandra Bullock, Thomas Haden Church, and Bradley Cooper as the eponymous Steve. The film is the winner of two Golden Raspberry Awards and has a 6% approval rating at Rotten Tomatoes. Mary Horowitz, a crossword puzzle writer for the Sacramento Herald, is socially awkward and considers her pet hamster her only true friend. Her parents decide to set her up on a blind date. Mary's expectations are low, as she tells her hamster. Mary is pleasantly surprised when her date turns out to be handsome and charming Steve Miller, a cameraman for the television news network CCN. Steve does not reciprocate her feelings. After an attempt at an intimate moment fails, in part because of her awkwardness and inability to stop talking about vocabulary, Steve fakes a phone call about covering the news out of town. Trying to get Mary out of his truck, he tells her he wishes she could be there. Mary believes him and decides to pursue him. Mary's obsession gets her fired when she creates a crossword titled "All About Steve". Following her termination, Mary decides to track Steve around the country in the hopes of winning his affection. She is encouraged by CCN news reporter Hartman Hughes, who hopes to use Mary's encyclopedic knowledge in his reports to help himself get a promotion to become an anchor. On the road, Mary annoys some bus passengers so much, the driver abandons her. She hitchhikes with a trucker named Norm, then meets and travels with a pair of protesters, Elizabeth, a ditzy but sweet and likeable girl, and Howard, who sells apples he carves into celebrities. She gradually grows close to the two . Steve and crew end up covering a breaking news story: an old mine collapsed with numerous deaf children stuck inside. Initially, it appears that the children are rescued. Mary, who arrives on the scene, accidentally falls into the mine shaft as well while making a beeline for Steve. It turns out that not all the children have been rescued, and Mary is trapped with one left behind. Steve begins to realize that Mary, in her own unique way, is a beautiful person. Just as Mary figures a way out, the two are joined by Hartman, who is made to feel guilty by Elizabeth and Howard for getting Mary into this predicament. Mary's rescue plan works, but she lets Hartman take the credit. Mary finally realizes she does not need Steve to be happy. She states, "If you love someone, set him free; if you have to stalk him, he probably wasn't yours in the first place." After the end credits, a competitive TV reporter, in despair that Hartman got popularity by falling into the mine while trying to save Mary, also jumps into the mine. 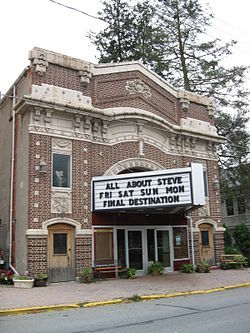 All About Steve playing at a theater in Pine Grove, Schuylkill County, Pennsylvania. Production began in July 2007. Parts of the film were shot at Mayfield Senior School in Pasadena, California. Scenes featuring the collapsed mine and sink hole were filmed at The Walt Disney Company's Golden Oak Ranch in Canyon Country, California. Originally scheduled for release on March 6, 2009, the film was not released until September 4, 2009. Rotten Tomatoes assigned the film a rating of 7% based on 135 reviews. The sites consensus states: "All About Steve is an oddly creepy, sour film, featuring a heroine so desperate and peculiar that audiences may be more likely to pity than root for her." Another review aggregator, Metacritic, gave the film an average score of 17/100 based on 27 reviews, indicating "overwhelming dislike". Audiences surveyed by CinemaScore gave it a grade of C-plus, a low score, indicating poor word of mouth. Roger Ebert gave the film 1 and a half stars out of 4. Time named it one of the top ten worst chick flicks. All About Steve opened at #3 behind the previous two weeks' #1 openers, The Final Destination and Inglourious Basterds with $11.2 million. The film grossed $33.8 million at the North American box office and has a worldwide total of $40.1 million. The film was nominated for five Golden Raspberry Awards in 2010, including Worst Picture, Worst Director (Phil Traill), Worst Actress (Sandra Bullock), Worst Screenplay (Kim Barker) and Worst Screen Couple (Sandra Bullock and Bradley Cooper). All About Steve ultimately won Worst Actress and Worst Screen Couple. Sandra Bullock accepted the Razzie for Worst Actress, giving out a copy of All About Steve to each member of the audience, promising to attend next year if they all watched to consider if it was "truly the worst performance". When an audience member thanked her for the copies, Bullock replied "You say that now". She won an Academy Award for Best Actress for The Blind Side the next day, making Bullock the first performer to win an Academy Award and a Razzie Award in the same year. ^ a b c "All About Steve". AFI Catalog of Feature Films. Retrieved August 1, 2017. ^ a b c "All About Steve (2009)". Box Office Mojo. IMDB. Retrieved 2011-09-07. ^ Moore, Roger. Sandra Bullock's All About Steve--Keith David lands the big laugh" Archived 2011-05-22 at the Wayback Machine, Orlando Sentinel, 2009-01-28. ^ Goss, William (February 10, 2009). "Release Date Shuffle: 'Steve' to Fall (Yay! ), 'Haunting' to Spring (Boo!)". Cinematical. Archived from the original on February 15, 2009. ^ "All About Steve Movie Reviews, Pictures". Rotten Tomatoes. Retrieved 2013-11-15. ^ "All About Steve (2009): Reviews". Metacritic. Retrieved 2011-09-07. ^ Webley, Kayla (May 26, 2010). "Top 10 Worst Chick Flicks - All About Steve". Time. Retrieved March 28, 2012. ^ a b Tim Masters (March 7, 2010). "Sandra Bullock wins worst actress award at Razzies". BBC News. Retrieved 2011-02-27. ^ "30th Annual Golden Raspberry Awards Nominations" Razzies.com. Retrieved 2010-02-01. ^ Sandra Bullock takes bow at the RAZZIES® (YouTube). 2011-01-13. Event occurs at 1:45. ^ "Oscar Winners" Oscar.com. Retrieved 2010-03-08. ^ "Sandra Bullock's Oscar acceptance speech, Razzie acceptance speech". Zap2It. 2010-03-08. Archived from the original on 2010-03-11. Retrieved 2010-03-10. This page was last edited on 13 March 2019, at 02:49 (UTC).